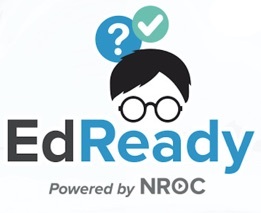 Previous: What do EdReady statuses mean? Now that you have a target score, you can work to improve your knowledge and increase your EdReady score on your Study Path. Since you will be spending most of your time in EdReady working from your Study Path, let’s take a moment to understand how to use and navigate it. Just like on your Target Options page, the Score Bar shows your EdReady score (in purple) and your target score (in blue). In addition, there are now ‘dots’ all along the line: these are the Units included in this Study Path. The purple dots (between your two scores) are Units you need to study in order to reach your target EdReady score. Any units you may see off to the right of your target score labeled as Additional units you could study are Units that are also included in the study path, but that you will not need to study in order to reach your target score. The triangle of the currently selected Unit will be pointed down and you’ll see a line connecting the dot to the current unit section of the page.